I made this pot for Edan Wingfield. I set out with the idea to incorporate many aspects that make him up as a person. I chose to focus around a time where he went on a trip with one of his best friends. They took a trip to Arizona and while driving they were cruising down a straight, empty road with nothing but sand. It was a road which he remembered so well, beautiful wide mountain ranges along the horizon. 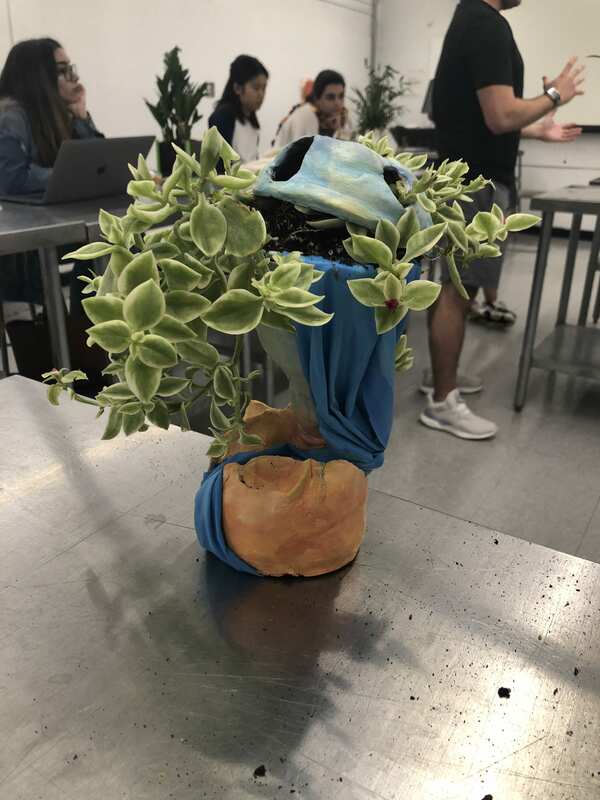 I decided I would build my sculpture with my plant surrounded by mountains. Thinking of the coloring of the pot I had the concept in my head of a sunrise, because of how much Edan has had to move around and start over, showing a new day with a new sense of hope. I added a waterfall flowing into the desert representing Edan’s parents. The desert is being engulfed with water which i decided to add in order to show the influence, and motivation Edan’s parents have given him, surrounding him with love and support. While exploring plant options I came across a store which had a vine looking succulent called Mezoo. The reason I chose this plant was because the different lengths and crazy feel of the plant show how much Edan thinks and how many different directions he’s gone through out his life.